Have you ever wondered what a font might smell like? Whether it can make a product appear more expensive? Or what your choice of font says about your personality? 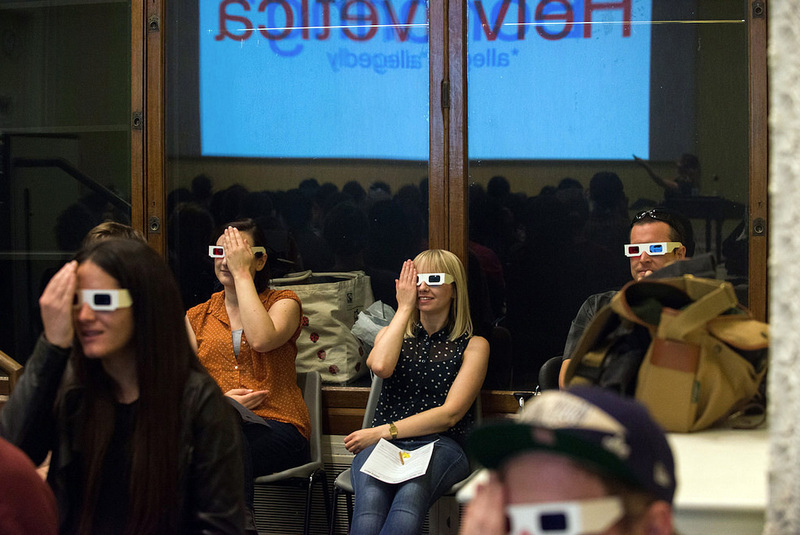 Join innovative type expert Sarah Hyndman as she invites you to join in with the research by taking part in a series of entertaining games and perception experiments with type. Profile the personalities of typefaces; judge whether a font can make a product more expensive and therefore more enjoyable, and explore whether it could even alter the taste of what you eat. Find out which typefaces you would date, ditch or be ‘just good friends’ with and how they reflect your own personality. 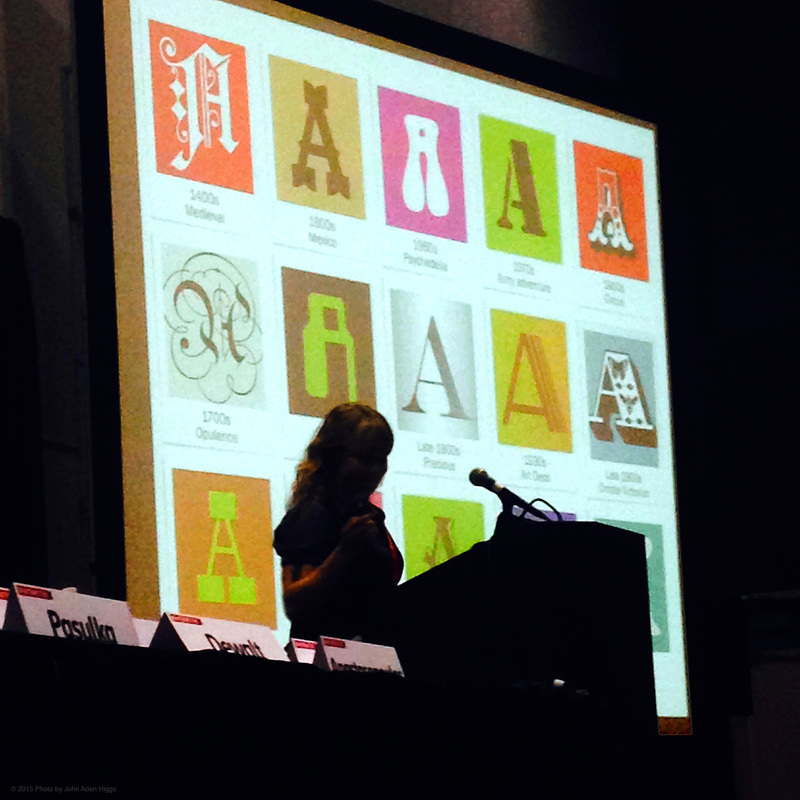 Sarah is the founder of Type Tasting, author of ‘The Type Taster: How Fonts Influence You’. You are invited into a ‘typographic wonderland’ of interactive games and experiments involving fonts which are designed to surprise and intrigue. These explore our role as type consumers and show how type is woven into the rituals of our everyday lives. Each font/typeface has a personality that influences our interpretation of the words we read by evoking our emotions and setting the scene. Come along and you can be a part of this innovative research and be the first to find out the results. 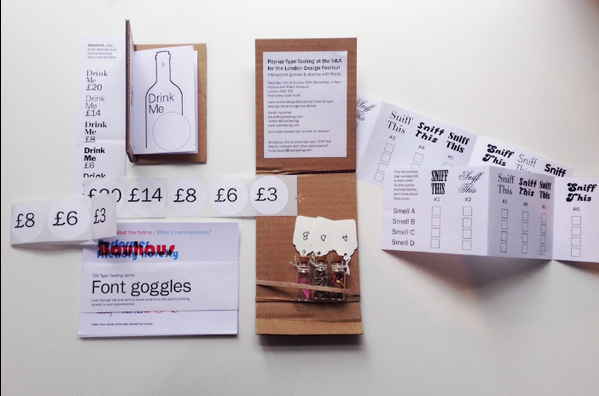 • Try on ‘font goggles’ to reveal what some fonts are really communicating to you. 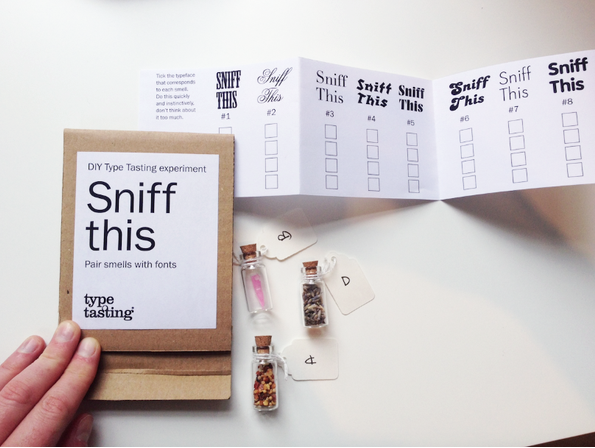 • Try your hand at font sniffing: can you match the smells to the typefaces? • Witness fonts altering the meanings of words right before your very eyes. • Be amazed that a font could have the power to alter the taste of your food. • See what personalities fonts have, and what they reveal about YOUR personality. • Can a font make a product appear more expensive? • Do fonts have recognisable personalities? • Can a typeface alter the taste of what you eat? • Can a font alter the mood of what you read? • When is a Serif a better choice than a Sans Serif typeface, why? As type consumers we interact with fonts in almost every aspect of our daily lives and while we are reading the words consciously, the fonts themselves are communicating directly with our subconscious brains. We are all experts as type consumers because we have been learning the references and associations fonts communicate all our lives. Type is both functional and evocative. Type functions as a carrier of words which it displays efficiently so that the reader’s eyes can glide effortlessly across the page as they read. However, type is not just functional: the different shapes and styles of the fonts themselves stimulate responses independently of the words they spell out, and before we even read them. Fonts not only inform the way we ‘read’ the world, they can also alter how we experience it. Some typefaces look expensive, while others appear cheap. As a result we assume that an identical product with a different font might be more expensive so we will expect to pay more for it. We are also likely to enjoy it more. For example if we think a bottle of wine is more expensive we will experience it as being more pleasurable to drink, even if it is the same bottle of wine. 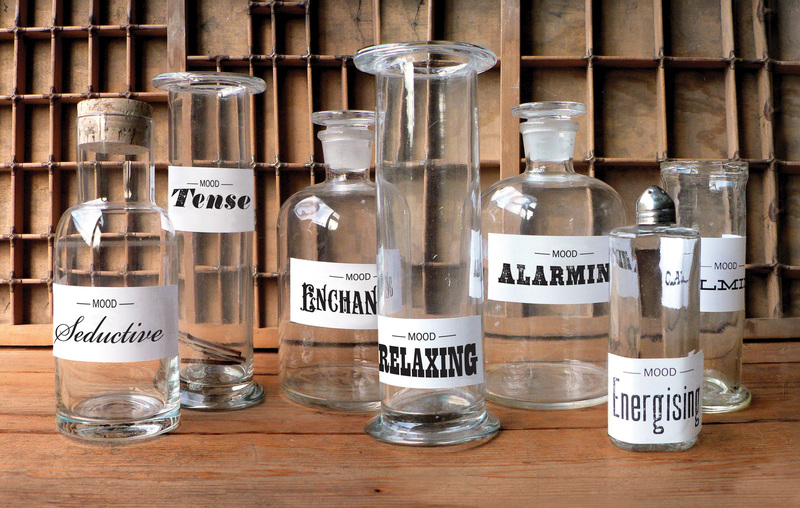 Type triggers our imaginations and evokes our emotions. Fonts can take you back to memories of your childhood, or they can be used to create a manufactured nostalgia of a time before you were born. Sometimes typefaces are designed to entertain and stimulate, other times they are there to keep you safe. 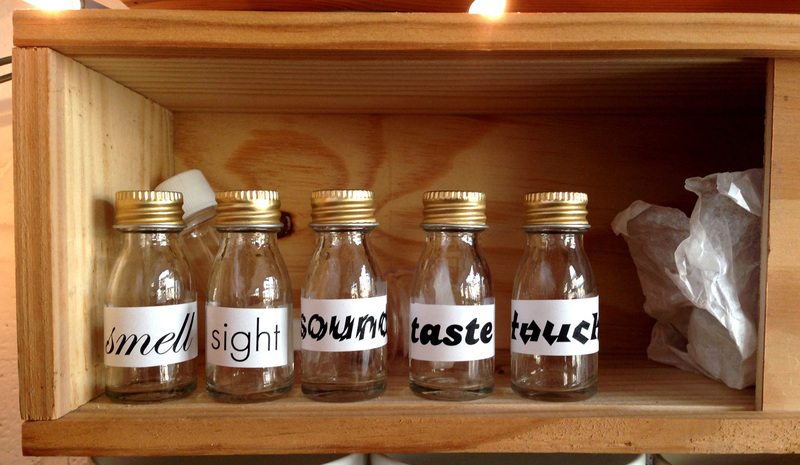 We don’t just see fonts, inside our brain we also hear, smell, taste and feel them. What we experience with one of our senses can trigger a response in any of our other senses. We automatically apply attributes from the physical world like how loud or quiet, how fast or slow a font sounds. When somebody sends you a text written in upper case it can feel like they are shouting at you. A Type Tasting game called ‘Type Karaoke’ invites people to read out words in the style suggested by the font which demonstrates this well as it has participants shouting, whispering and crooning. We understand what fonts would taste like from information coded into our DNA and the associations we learn from food packaging. For example you will match a sweet taste or smell to a round-shaped font, and a spicy taste or smell to more angular shaped letters. Not only do you know instinctively what a font might taste like, but it can also alter the experience of what you eat. At the London Design Festival last year Sarah invited the 100 members of her audience to eat two jellybeans, both the same colour and flavour. One was eaten whilst looking at angular-shaped letters and the other whilst looking at a round shaped typeface. The audience rated the sweets eaten to the jagged-shaped letters as tasting 11% sourer, and the identical jellybeans eaten to the round typeface as tasting 17% sweeter. The font actually altered how the sweets tasted. Type Tasting events are designed to be enlightening and entertaining, debunking the idea that typography is a ‘stuffy’ or ‘dull’ subject. They are created for all of us as type consumers, not just designers, so everyone is welcome to come along and join in. When you come along to a Type Tasting you have the opportunity to contribute to the ongoing research by taking part in the games and experiments. You can leave your details if you’d like to find out about the results. Sarah’s research takes a number of forms. Along with the live events and online surveys Sarah also works on collaborative research with the Crossmodal Research Laboratory at Oxford University. Professor Charles Spence and his team investigate how our understanding of multisensory perception can be used to improve the experience of everyday objects. 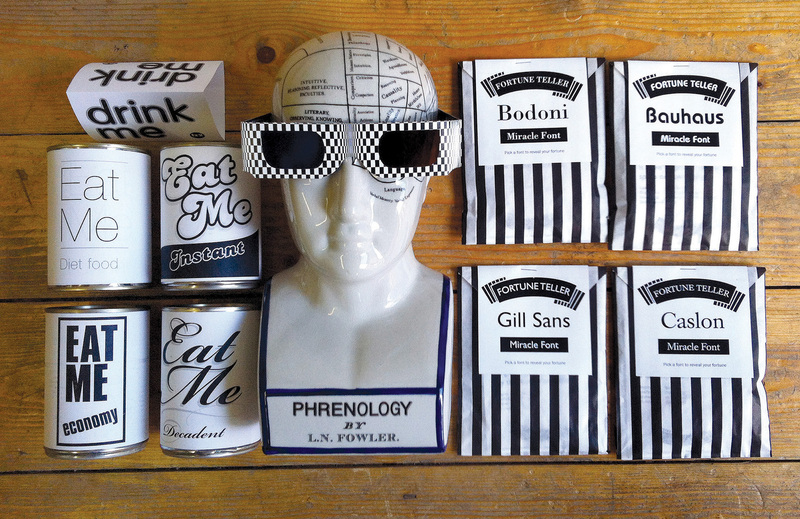 Their first collaborative study ‘The Taste of Typeface’ has just been published. 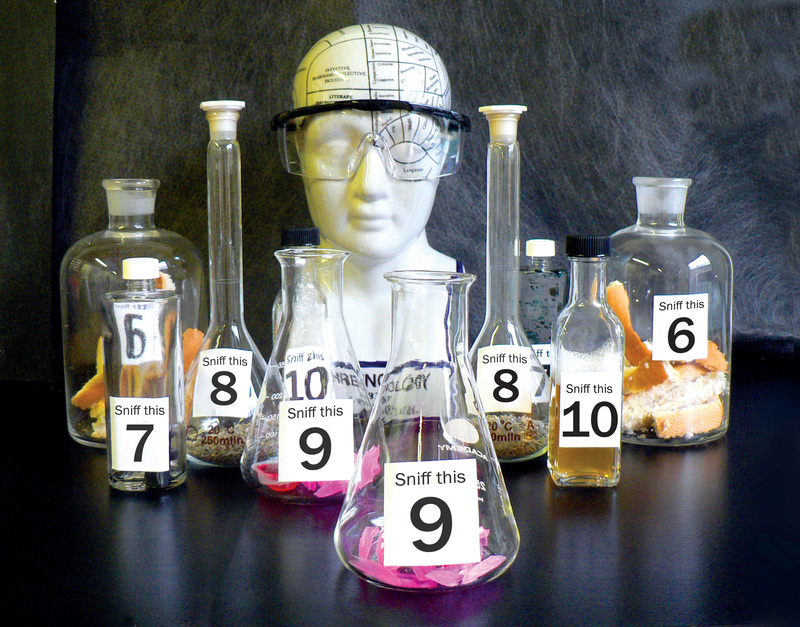 Come along and take part in a Type Tasting experiment with the Crossmodal Research Laboratory at the Science Museum Lates on 30th September. Sarah Hyndman launched Type Tasting in 2013 with an evening of Typographic Swearing ’n’ Cussing. She now spends a proportion of her time on research projects and is a consultant for a range of clients. Sarah self-published her first book in February of this year and it has been picked up by Penguin/Random House who will publish future editions. She is currently writing a second book for Laurence King Publishing. Sarah creates bespoke Type Tasting events and team building days. 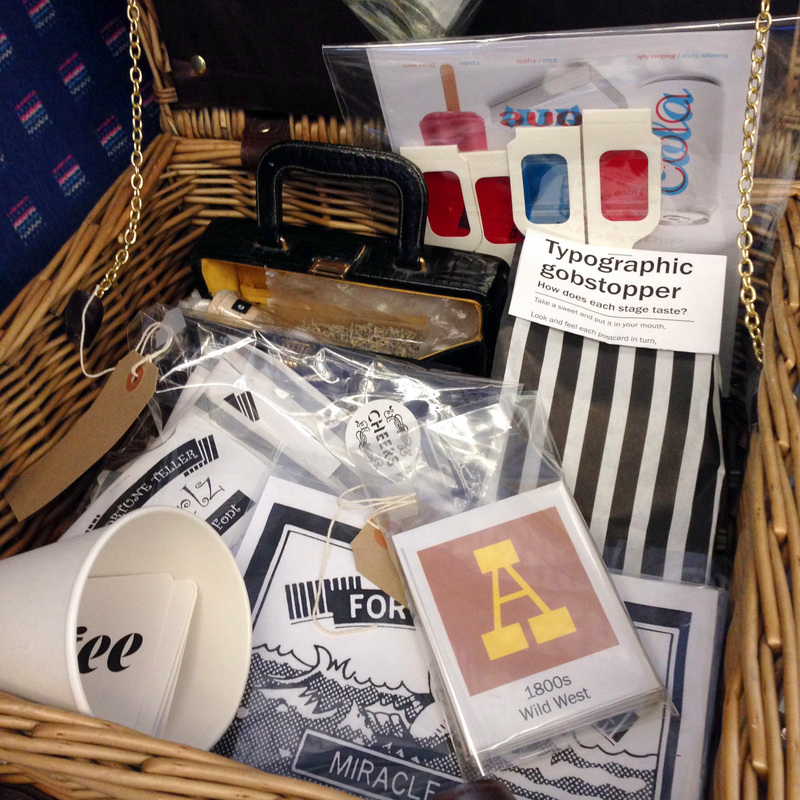 Recent Type Tasting events have included booze and font matching, coffee and typeface pairing, and a live version of the online Type Dating Game. Sarah has created previous Type Tastings for Pick Me Up at Somerset House, Huddle at Mindshare UK with Monotype and South by Southwest in Austin, Texas. She also runs workshops for the D&AD. Sarah has been interviewed on BBC Radio 4’s ‘Today’ and ‘The Arts Hour’. London Live, June 2015. Live TV interview. TYPO San Francisco. May 2015. Clerkenwell Design Week, London. May 2015. Elysium 20×2, Austin, Texas. March 2015. South by Southwest (SXSW), Austin, Texas. March 2015. London Design Festival at the V&A. September 2014. Sarah has been a graphic designer for almost 20 years and ran her own design company for a decade. She gained a distinction for her masters degree in Typo/Graphics at the London College of Communication (University of the Arts). She was subsequently invited back as a guest tutor to set up and run the year-long Experimental Typography course.